One of my favorite things about food blogging is getting to try new fun products that hit the market. 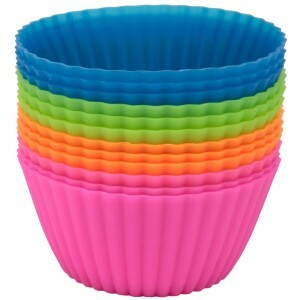 I was recently contacted by Rizzi from the New York Baking Company to try out their new silicone baking cups. I love baking cupcakes and muffins so I was very excited to try these out. When they arrived, I loved the bright colors that they came in. You don’t have to grease or oil pans. Silicone heats quickly and bake evenly without dark edges or being burnt on the bottom. Removal from silicone is super easy. Cleanup is quick and simple. 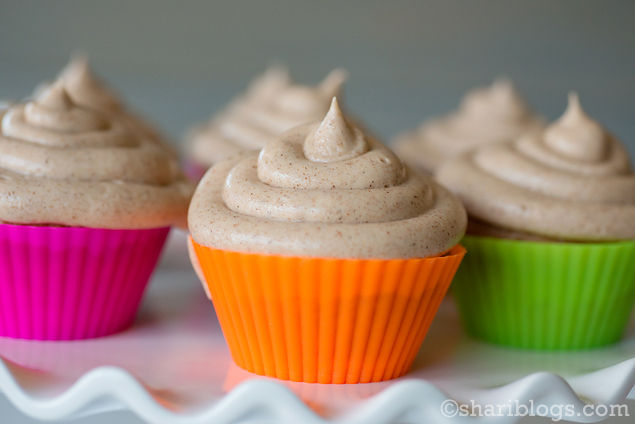 I decided to try these out with my favorite Cinnamon Cupcakes with Cinnamon Buttercream Frosting. Yum!! These cupcakes came out PERFECT! One of the things I love about silicone liners is that your baked good are so easily removed from the liners. They didn’t stick, crumble or fall apart. That is one thing that is very important to me when I am baking cupcakes or muffins. They were cooked evenly and so very moist. I didn’t have any dark bottoms or sides on my cupcakes. I give these a definite two thumbs up! Again, you can pick them up here. The only cons would be that they are a little pricey if you are baking for a party and need to buy several packages. I would also like to see them in more colors and patterns as the neon colors aren’t suitable for all themes. However, I think they are perfect for your everyday baking needs. Disclosure: I was given this product from New York Baking Company to try out in my own kitchen. All opinions expressed here are my own.